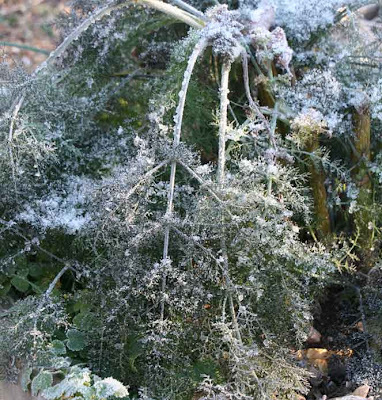 Ever wonder why some herbs are popular in summer while others only cross our thinking in winter? 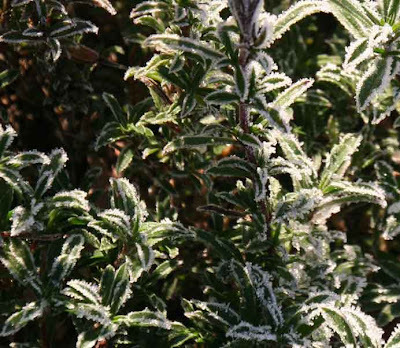 Why are sage and hyssop used mostly in winter? 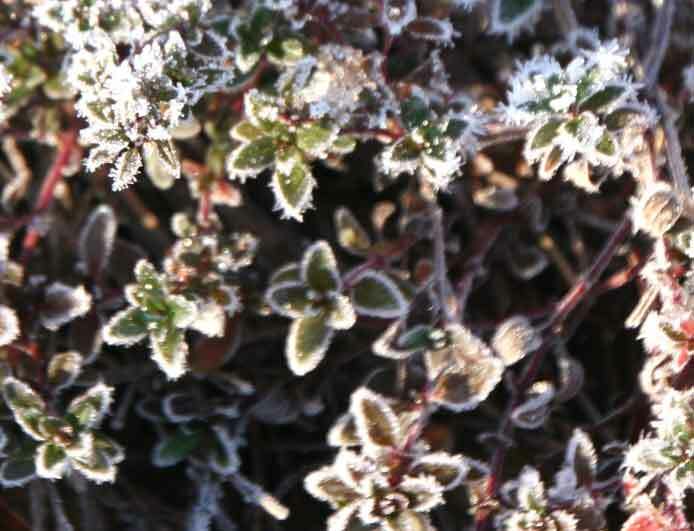 Hyssop, taken early morning before the frost melted. When I visited India a few years back, I learned that Indian cooking pays more attention to seasonal herbs and spices than we do here in the U.S. My hosts showed me various seasoning mixes, some created specifically for summer, their properties causing the body to cool, while the winter mixtures were meant to warm the body. My friends explained that if you used a summer garam masala in winter, for example, you would be chilly and uncomfortable. Rosemary (this variety is 'Barbecue'). 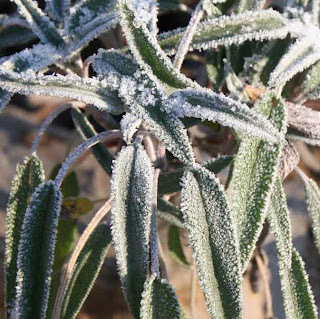 The traditional winter herbs we think of around the holidays, such as sage, rosemary, thyme and hyssop, are herbs that warm the body. They're typically European herbs, coming from places that are cold in winter, places where winter foods historically included fat roasted goose, pork, bacon, ham. Those fatty foods were perfect for adding calories to the diet, building body fat to help keep the body warm in a cold climate. 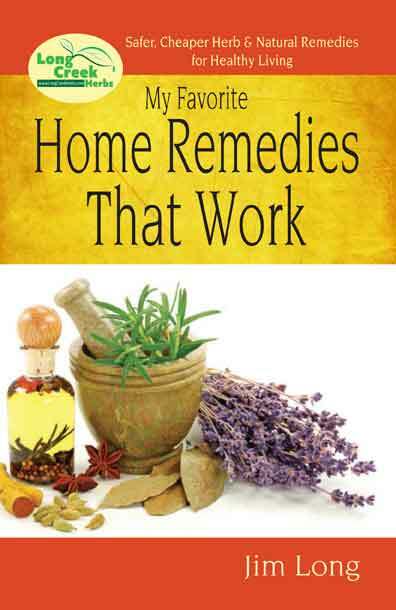 With those heavy foods, herbs were added to counteract the animal fats. With roast goose, for example, hyssop was the traditional herb to help tone down the taste of the greasy taste. Sage has long been used as a sore throat gargle in winter. It's a warming, pleasantly bitter tea, sweetened with honey, that is amazing refreshing after being outdoors for a long walk. 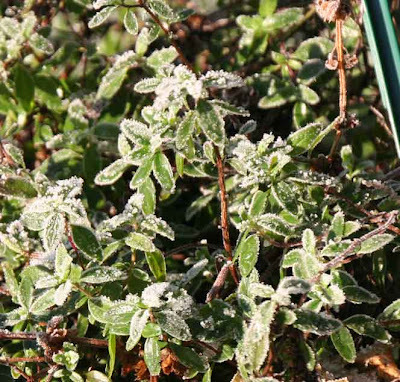 Thyme, another winter herb, is evergreen in my climate (Zone 6-b). 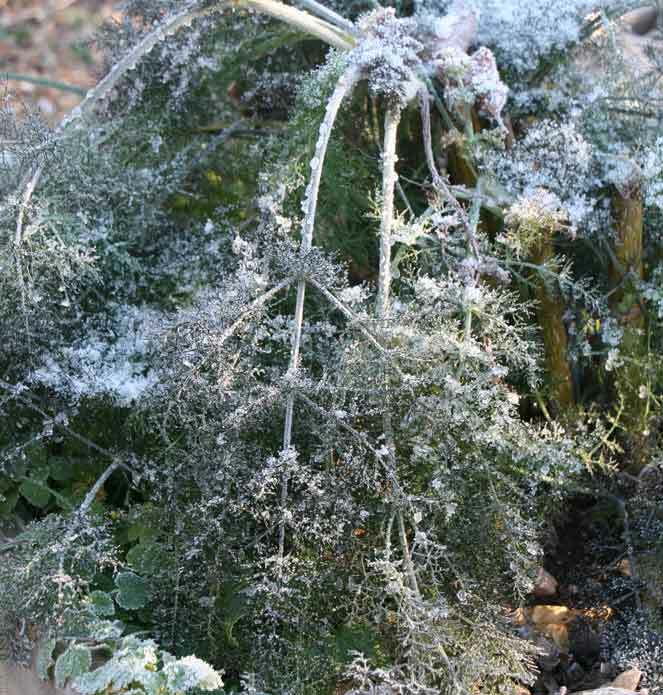 Even with a hard freeze and frost, this incredible herb keeps right on growing. You likely know it as one of the ingredients in poultry seasoning and its warming flavor is most welcome in stuffing or dressing served with holiday turkey. But did you know thyme is an excellent gargle for sore gums or little cuts in the mouth? If you read the ingredients on the Listerine bottle, you'll see thymol, or oil of thyme, as the primary active ingredient. 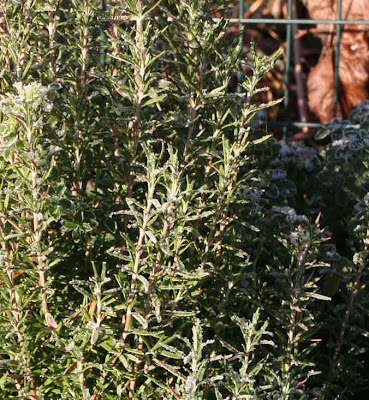 Rosemary is also considered a warming herb. 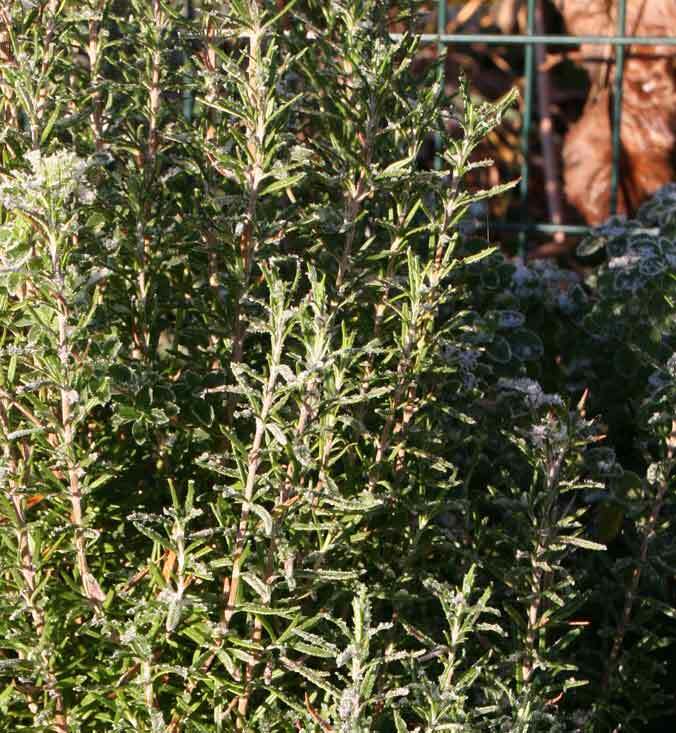 While you may use rosemary in summer on occasion, it comes into its own in winter as another ingredient in some poultry and pork seasonings. Mixed together, these herbs will warm the body and add flavor to winter meals. 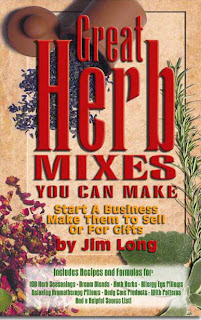 Here's a recipe to make your own poultry seasoning from my book, Great Herb Mixes. (Cutting corners before Thanksgiving, I looked in the grocery store for a container of poultry seasoning. I was disappointed to find a little jar of McCormick poultry seasoning, less than 2 tablespoons full, for $2.59; I choose to make my own!) My book has 4 poultry seasoning recipes (plus another 96 of other kinds). Here's the recipe. Herbs are dried. 2 Tablespoons each: Sage, Parsley, Celery leaf and Marjoram. Mix together and grind to a powder in a food processor. Store in airtight container. Use 2-3 teaspoons for a chicken added in the last half hour of cooking time. The pepper just looks mean, even fresh like this one. The heat is inside, however, not on the outside. You may remember I've been writing about Bhut Jalokia peppers each year for the past 3 or 4 years. Back when the seed was nearly impossible to get, I was one of the few people growing the plant. If you did a Google search for the words bhut jalokia, you would find my blog at the top of the searches. Now there are lots of posts about this famous pepper. Even Bonnie's Plants, a nation-wide plant distributor, offered the ghost pepper in selected markets. So why such a strange name, and what's so special about this pepper? It came originally from Sri Lanka or Bangladesh, sources differ. The farmers there claimed it to be the world's hottest pepper. The University of New Mexico, which is a world-class bunch of pepperheads and experts, decided to challenge the Sri Lankans and conducted several seasons of pepper-heat trials with the pepper. Guess what? Those fire-eating Sri Lankans were right. The Univ. 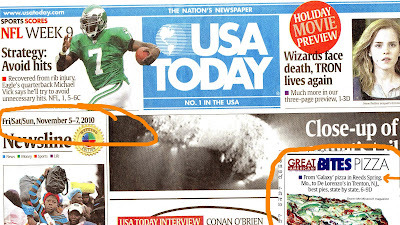 of Mexico certified the ghost pepper is the world's hottest! (Unfortunately they claimed they had "discovered" the pepper and got it listed in the Guiness Book of World's Records under their name). The stinkers. The ghost peppers grow on a plant that reaches about 48 inches high, and almost as wide. The word, "bhut" a Hindi word, simply means hornet, while "jalokia" is simply Hindi for pepper. So whether you call this pepper a Bhut Jaloakia (hornet pepper), or a Naga Jalokia (ghost pepper), they are one and the same (ghost refers to the fact you think you will die from the pain, leaving just a ghost). To give an idea of the heat of a bhut jalokia, a jalapeno is rated at around 8,000-10,000 SHUs (Scoville Heat Units, the international measure of pepper heat). A Habanero or Scotsh Bonnet weighs in at 50,000 to 80,000 SHUs. (The former World's Hottest Pepper, the Red Savina Habanero, which rates at 577,000 SHU). The Bhut or Naga Jalokia comes in at (drum roll please)... 1,001,304 SHU. Exponentially hotter than a Habanero. The Indian Government this year announced it is using the ghost pepper in new smoke grenades in their arsenal of weapons to combat terrorists. The pepper powder, combined with the smoke, produces non-harmful means of stopping any angry crowd it its tracks. Read the story here on NPR. Just before frost I harvested all of my hot peppers. I grew 18 varieties, plus the Bhut Jalokia and the Naga Jalokia (to see if they were different, they aren't). Because of our drought, no rain from July 4 to September 5, with hot winds that knocked the blossoms with little fruit set, our crop of chilies was pretty poor. I gathered about a half bushel or so, a quarter of what the crop should have been from that many plants. I've been getting them ready for the dehydrator (meaning, I cut the stem end off and make a slit in the pepper, to shorten the time needed in the food dehydrator). One of my favorite peppers this year is the Shishito, seen above, third from the left. They have little heat, but when flash-fried in a very hot, dry skillet for about 60 seconds, then salted, make an outstanding snack. The edges are roasted, while the primary part of the pepper are still crisp. I found these in the Farmer's Market in Santa Fe last year and was so impressed, had to grow them. The pepper on the lower bottom, right, is a sweet bell pepper called, "Yummy Orange" which mixes well with the hot peppers for a combination of flavors. The peppers, stem ends cut off, go into the food dehydrator. It takes about 3 days to dry them to total crispness. I've filled the dehydrator several times, then filling gallon plastic bags with the dried peppers. So just what do I do with my dried peppers? I put them all into the food processor (wearing a mask and goggles because even the dust is painful) and processing them into small flakes. Those will become my winter pepper seasoning, and gifts for some of my pepperhead friends. Here's an outstanding hot pepper sauce recipe that my friend Eric Jeltes, birdman from the St. Louis Zoo shared with me and he said I could share it with you. This isn't especially hot, but really good flavor and we like it on everything. Thank you for sharing this, Eric! -Heat a skillet to med/high and add veggie oil, onions and garlic and sautee until onions are translucent. -Add water and carrots and heat until boiling. Cover, turn down the heat, and simmer 20 minutes until carrots are tender. -Put everything in a blender and blend until smooth. For a thinner sauce add more water. You can't have pizza without a garden being part of the process. 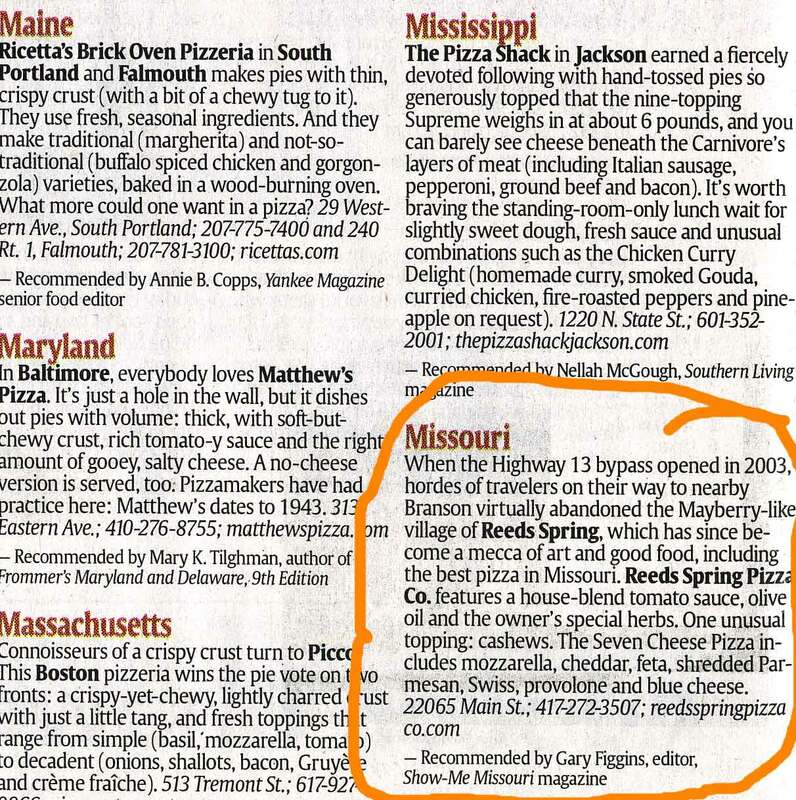 Our long time garden friends, Paul Lear and Flavie Mirat, who have Reeds Spring Pizza Co, in Reeds Spring, Missouri, received a great honor this week. 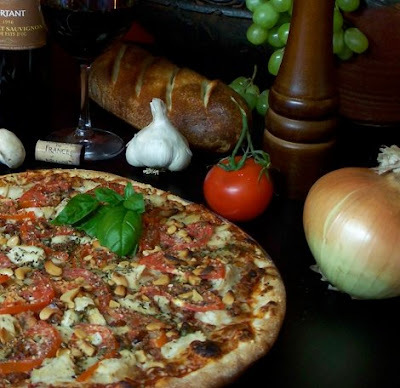 (I've been crowing about their outstanding pizza for 2 years, brag, brag...) USA Today, this past weekend, chose ONE outstanding pizza place from each state and published 51 of the most outstanding pizzas in America. 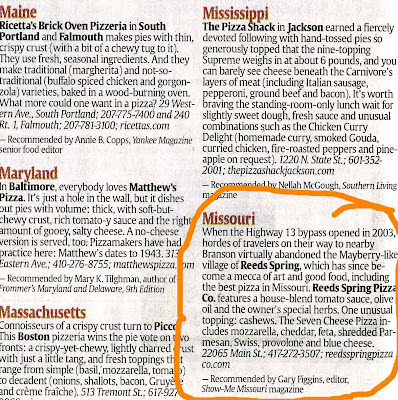 Reeds Spring Pizza has been chosen as THE BEST PIZZA IN MISSOURI. Congratulations Flavie and Paul. It's a well deserved honor. Reed Spring Pizza Co. made the front page, bottom, of USA TODAY. Pictured above in the article on the front page of the newspaper, although you can't see it clearly, is their famous Galline Pizza, my fav. The ingredients are: basil pesto, their special house blend tomato sauce, grilled chicken, bacon, sliced tomatoes, cashews, shredded Parmesan and topped with herbs. Yummmm! That's their pizza again at the beginning of the article. The article and survey is for 51 of the greatest pizzas in America. Fifty states, plus the District of Columbia. That's a lot of competition. You can look it up online to see what pizza place is the best in your state! To see their menu...click this link. Join them on FaceBook, simply type in Reed Spring Pizza in the search box and become a fan! What's so special about Reed Spring pizzas? An outstanding, homemade crust, a house blend sauce and fresh ingredients. A bee, sucking up nectar from a basil flower. It doesn’t cost anything to love others. Even when it appears it might be. This past weekend was the Small Farm Conference in Columbia, MO. This was the 18th year for the conference, sponsored and organized by Small Farm Today magazine. I've written for them off and on for years and the magazine covers a lot of farm subjects, everything from cattle grazing to potbelly pigs, llamas, poultry, gardening, herbs and home canning. There were heritage breed turkeys on display, and for sale. The Conference has 3 tracts of speakers each of the 3 days, with subjects ranging from organic gardening, building raised beds and choosing the right heirloom vegetable for your garden, to cattle breeding, pasture management and livestock subjects. Each year the conference features dog trials and judging, where farm work dogs show off their skills at herding various animals (sheep, cattle, in this instance, ducks). It's a lot of fun to watch how the dogs work to outsmart the critters they're herding. The goal was to put the ducks in a cage by convincing them it was their idea. I spoke on using Marketing Your Business Through Social Media. I showed examples of my blog page here, my FaceBook and Twitter pages, too, and made the point that Social Media is the way small businesses can compete with the big businesses. If Conan O'Brian can have over one million people following him on Twitter by simply saying stupid things, then a business can do well saying smart things. There were lots of interesting vendor booths. This one was offering engraved rocks for your garden, either ones they have in stock, or you can special order words to your liking. Weed This Garden! anyone? Soap, brooms, lots of interesting produce from the garden. One booth was simply elderberry syrups, jellies and juices. Evidently the hot new berry to grow is elderberry with several newly released varieties. Some bloom all at once (determinate) while others are bred to flower and fruit over an extended time (indeterminate). I came home with elderberry jelly and syrup, with some stem cutting to root for my garden next year. This was my Long Creek Herbs booth, between an agriculture products business and the Missouri Conservation booth, on the right. I met a lot of really interesting people at the conference and the continuing interest in organic, sustainable growing and local foods was prominent. Over the years of going to this conference, I've met lots of interesting people. It's where I first met our friend, Gayl Bousman who has Evening Shade Farm and who makes wonderful goats milk soap. This was another not so good food trip. I've never had a particularly good meal in Columbia, Missouri. Possibly being a college town, it's just not known for good food, and this year was no exception. I always try to find interesting food there, but it's pretty slim pickings. Lots of information is exchanged over the chicken coops. I've been on the road a lot this fall season, speaking at a lot of conferences and events and as much as I enjoy it, I readily admit, I'm glad I don't have any more speaking gigs until next March in Michigan! I need to get back to working on my own garden cleanup and construction. And I have hot peppers to process and dry. Happy gardening! Some of you may remember my posting last April when I visited the amazing Four Winds Waldorf School in Warrenville, IL, on the outskirts of Chicagoland. I'd visited then because I had an invitation to give a wattle fence workshop, and wanted to check out the location. And I was curious why a private school wanted a wattle fence around a playground. After my tour and visit with Marianne Fieber, the school Administrator, I understood. It's not your ordinary school but one in which the students and children are as involved and engaged as the teachers are. A wattle fence to surround the playground was Marianne's vision, something she's been working toward for a couple of years. She said she had seen a wattle fence at another Waldorf School and thought it would be perfect for the school in Warrenville. (To learn more about Waldorf Schools world-wide, visit their link, it's a very interesting concept). One of the aspects of the school that I admire is the teacher a child starts with in kindergarten or first grade, is the teacher for that class through all eight grades. There's also a connection for the students with nature, plants, gardening and the seasons also, and I really admire that, too. So the workshop. We'd planned on having 15 or 20 people, for 2 workshops, one on Saturday and one on Sunday. Garden Writer of America members around Chicago were invited, as well as local media people, in hope of giving the school and the project some publicity. Possibly because the School had just had a harvest festival, or who knows why, the turnout was pretty disappointing. At 9:00 a.m. on Saturday, starting time, no one showed up. It was just Marianne and me, and a bit of misting rain. She made some calls, a couple of folks were on their way. By about 9:30, we had 4 more people, including 7 year old Ezra who was anxious to learn about the project. Then it began to rain. In the rain, everyone struggled to cut saplings from the school grounds. That's Bruce Cooper, the 7th grade teacher and Rich Hill, one of the parents, working with soggy wet saplings. The ground was hard packed, so pounding the 36 inch posts in the ground was a challenge. We cut the posts from the woods and sharpened the ends, but it took an iron bar pounded into the ground with a sledge hammer to make a hole before we could then drive the sapling posts into the ground. (The building method is to put posts in the ground about every 38 - 48 inches, then weave saplings through them like a basket weave). Beginning to weave the saplings between the posts. It takes a lot of saplings to do this project - which is why we were hoping for a large group. We were only able to do about one fourth of the fence Marianne envisioned, but we made a good start. This was the only time that Ezra sat down. Most of the time he was pruning the limbs off saplings as his father and the 7th grade teacher, Bruce, brought them in from the woods. Ezra kept us all cheerful even though we were soaking wet. We were determined to make progress, even though we were a small group and in spite of the rains. As the fence shaped up, we decided it needed an arch, a "magical" entrance to the part of the playground where the yougest children play. Lynn Hill, Ezra's mother, cutting saplings to size. Marianne Fieber, school Administrator, worked tirelessly to see the fence take shape. One of the goals of the wattle fence was to make a barrier to keep the youngest children from darting into the parking lot. The lot doesn't have traffic, but the teachers wanted a way to keep the little ones closer to the sand pile and playground equipment. We chose this pass-through, not quite a gate, not quite a wall, but a visual barrier. You'll notice the parking lot and my pickup in the background, where I'd unloaded the tools for the project. Corona Tools donated a pair of loppers and a pair of pruners to be given away at the workshop. This is the Hill family, Lynn, Rich and Ezra, who worked really hard all day and were pleased to take home the great Corona lopper. Pat Clancy, who was the recipient of the Corona pruners, had just left to go home and find dry clothes but we got the pruners to her afterward. Ezra mastered the use of the tools and was already making plans with his mother for what kind of bentwood fence he would build in their home garden. Corona Tools provided a set of loppers and pruners for the workshop. And here's a section of the completed fence. The goal was to build a barrier, one that could be seen through, walked around, but a visual barrier for the smaller children. We accomplished that in spite of the obstacles. Tired, wet to the skin, we cleaned up, everyone pleased with what we had accomplished for the school. Thank you, Marianne for your vision, and to the workers for their help. This is a very unique school and it was a joy to be a small part of it. And a big thanks to Corona Tools for their generous donation!